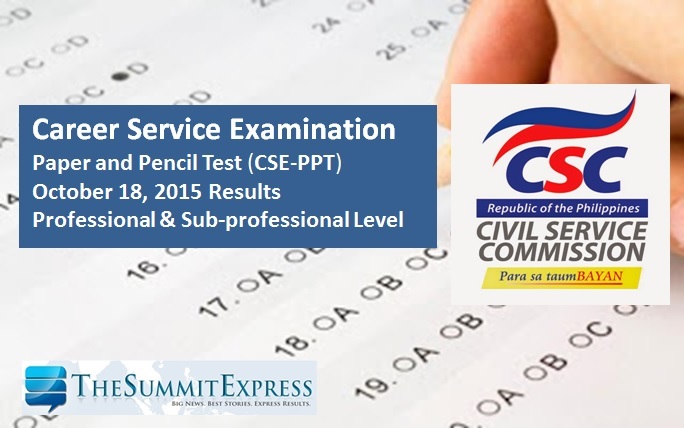 The Civil Service Commission(CSC) released results of October 18, 2015 Civil Service Exam - Paper and Pencil Test (CSE-PPT) also known as Career service examination on Saturday, November 28, 2015 for the professional and Sub-professional level. The complete list of passers out of more than hundred thousand registered examinees is now available here as we update this webpage. Note that CSE-PPT at the following areas: Region 1 (Ilocos Region), Region 2 (Cagayan Valley Region) Cordillera Administrative Region (CAR), National Capital Region (Metro Manila) and Tawi-Tawi was rescheduled to December 6, 2015 due to Typhoon Lando. The examination results for this expted to be released sometime in January to February 2016. CSC said that individual test result generation through OCSERGS (Online Civil Service Examination Result Generation System) for October 2015 CSE-PPT passers shall be available by Dec. 14, 2015 and thereafter. The certification of Eligibility for passers (printed on CSC letterhead, free of charge) shall be available by January 4, 2016 and thereafter.